Piece by Piece breaks down the equation of great style on a real college budget. When we love a look, we do the work by scavenging the internet for the absolute best-priced items, then recreate it for you! No trend is too extravagant, no look is too lavish, and no fashion moment is out of reach for the stylish College Fashion reader. 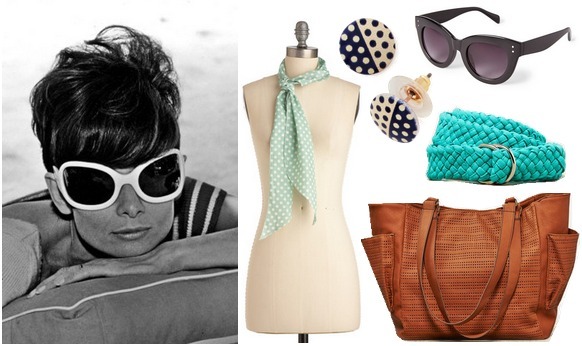 Miss Audrey Hepburn‘s Roman… I mean, summer holiday attire inspires our first Piece by Piece post. You can channel her carefree summer vibe with the pieces below, all of which ring in at less than $30 each. 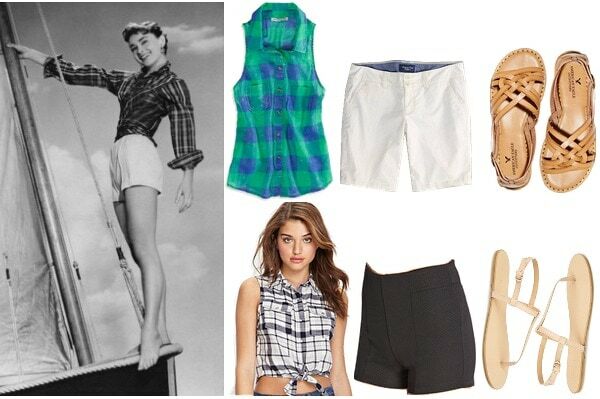 A plaid top, crisp shorts, and neutral sandals are all it takes to recreate Audrey’s sailing look. Boat and shoes optional, tousled hair and winning smile mandatory. Audrey’s second look, which is perfect for a summer afternoon spent on some beach-side wooden steps, is achievable with a simple, neutral-hued crop top of your choice, nautical-inspired striped shorts, and comfortable slip-ons. I love a good loafer, and the cobalt blue one above looks modern and trendy, yet the shape is classic and timeless. Audrey was too busy dangling off the back end of a boat and smiling coyly at beach-goers to accessorize much, which leaves plenty of room for you to personalize. Tacking on to the easygoing summer vibe, colorful classics, like a dotted scarf and large tote that could easily transition beyond the summer months, are some fab Audrey-inspired choices.